Berjaya Auto Philippines, the exclusive distributor of Mazda vehicles in the country, and the ANC Group of Companies, have collaborated to put up a brand new full-service showroom, service and parts facility in Pulilan, Bulacan. Mazda Pulilan is the latest addition to Mazda Philippines’ growing dealership network. Located along DRT Highway, Sto. Cristo, Pulilan, Bulacan, the 123-square meter showroom facility features four of the latest Mazda Skyactiv models available today. The all-new showroom facility also provides after-sales services for Mazda owners. With its 192-square meter service lot and two workshop bays, Mazda Pulilan will be able to cater to a wide range vehicle work from Periodic Maintenance Services to diagnostics and mechanical troubleshooting. Moreover, comfortable customer lounge with air conditioning with more than ample seating is available for Mazda owners who wish to wait for their cars to be serviced. “Mazda Pulilan is our humble way of bringing Mazda vehicles and its well-renowned customer services to the people of Bulacan and Nueva Ecija,” shares Anthony Cheng, Chairman of the ANC Group of Companies. 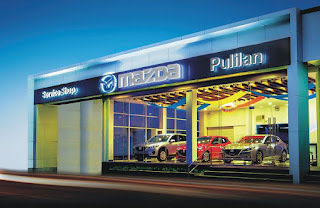 He adds, “Through this facility, we hope to provide full customer satisfaction for Mazda patrons here in the north and provide them the quality service they deserve.” This is the fifth Mazda showroom owned and operated by the ANC Group of Companies following Mazda Alabang, Mazda Pasig, Mazda North EDSA and Mazda Quezon Avenue. The all-new Mazda Pulilan service center is open from 8:00AM to 5:00PM, Mondays to Saturdays. The showroom is open until 6:00PM on Mondays to Saturdays and from 9:00AM to 5:00PM on Sundays. kelan kaya sa bicol region? ?